Easter Bunny brings eggs, or is it the Easter Clocks? Happy Easter to all my readers! 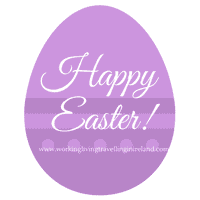 Easter is celebrated around Ireland this weekend! The kids have been off school for a week now, and have another week to go! Typically you can participate in an Easter Egg Hunt ( I recommend the one at Kylemore Abbey), where rabbits hide Easter eggs in the garden or around the house. Wikipedia gives you a thorough overview of the origins and history of Easter. It also touches on the tradition of chocolate eggs, and how the Easter Bunny brings the eggs or? As I am from Belgium, I grew up with a very different tradition. It was only when I moved to Ireland, I came to realize that my Easter Eggs came from a very different source… Can you guess?? Well, my Easter Eggs came from flying church clocks ! What ??? If you didn’t grow up with this, this sounds mad, but to me ( and any other Belgian native) this is very normal. Who said Belgians were boring!! So the story goes that on holy Thursday eve ( Maundy Thursday, in Belgium it’s called White Thursday- the day Christ had his last supper – okay, I had to Google this ), the church clocks./bells ( see image above) don’t chime until Easter, as the church bells are en route to pick up Easter Eggs in Rome. Once they are loaded up, they fly back to Belgium, drop the eggs ( packaged if it’s wet !) in gardens all over Belgium ( or inside if you don’t have a garden). Once they have done their job, the church bells start chiming again. As a child at school, I would colour Church bells, decorate eggs, and be slightly afraid to walk outside, as you might just get hit by an Easter egg! Unlike the Easter eggs in Ireland, they don’t tend to be packaged, they are loose ( or smaller ones foil wrapped), and you’d have dark chocolate, white chocolate and milk chocolate eggs.. My favourite was always the white chocolate eggs filled with chocolate pralines in them.. yummie… Not to deprive you from any of these, Amazon will gladly send you out these goodies. If you click on them, and were to decide to order them, I get a very small fee. If you haven’t got your Easter eggs by now, you are not entirely out of luck, as if there are any left after tomorrow( when all shops are closed) you might get your hands on some heavily discounted ones..
Oh my gosh, flying church clocks, I’d have never guessed that! I only got one easter egg myself though I’m not a big fan of chocolate so I’m not surprised I will be stocking up in the next few days when the discounts hit the shops so I have chocolate for movie nights!